My latest paper is out today on the subject of theropod wrists. However, first credit must go to project leader Corwin Sullivan who has also penned this post for the Musings on our research. I’ll be adding a bit more tomorrow with my take on the paper, but for now, take it away Corwin…. Birds are strange vertebrates in many ways, and one of their strangest features is a highly distinctive type of wrist. A good way to understand this distinctiveness is by comparison with humans. Start with your right hand in front of you and held palm downwards, as if ruffling the hair of some cute little hobbit from Flores. Now brace yourself for just a bit of necessary jargon. Your wrist has a degree of mobility in four directions: it can flex to point the fingertips towards the ground, extend to point them towards the sky, adduct to point them to the left (remember that we’re talking about your right hand here) or abduct to point them to the right. The wrist can adduct about as far as it can abduct, but both movements are fairly limited in comparison to flexion and extension. In birds, by contrast, flexion, extension and adduction are all extremely restricted. In fact, the capacity of a typical bird wrist for adduction is less than zero, in that the wrist cannot even be straightened beyond a position of slight abduction. However, the wrist can abduct like crazy, to the point where the hand is folded back to lie more or less alongside the forearm. This is what a bird does when it folds its wing, and the wrist is also partly abducted during the upstroke in flight. Archaeopteryx in UV light showing a nicely flexed wrist. Image courtesy of Helmut Tischlinger. A couple of years ago, I began to wonder how and when this asymmetric wrist joint – impressively flexible in one direction, but not in the other – had evolved. Whatever my crimes against nature and the gods, I’m not so perverse as to doubt that Birds Are Dinosaurs, so another way of putting this question is to ask whether at least some theropods close to the origin of birds had an incipiently avian-like wrist. 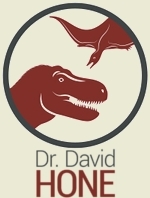 One day in May 2008, after weeks of furtive glances at the hands and wrists of Dave Hone’s toy dinosaurs, I sat down to discuss the issue with the man himself. One thing led to another (no, not in that sense), and now a paper by us and our respective postdoctoral supervisors Xu Xing and Zhang Fucheng has just been published online by Proceedings of the Royal Society B. The paper is the result of looking at the wrist bones of modern birds, trying to identify features that account for the asymmetric mobility of the joint, and looking for those same features in fossil theropods. We focused on two features, one of which was already well-known to vertebrate palaeontologists. The well-known feature is a bone called the semilunate carpal (affectionately known as the SLC), which in birds is incorporated into the fused hand. The SLC bears a highly convex surface that articulates with another wrist bone, the radiale, and it’s the convexity of the SLC that accounts for the fact that the avian wrist has a large range of motion. But why is that range of motion so asymmetrically distributed? Enter the less well-known feature, which has to do with the radiale itself. In birds the face of the radiale that articulates with the semilunate carpal is obliquely aligned, rather than perpendicular to the trend of the forearm. This obliquity gives the radiale a wedge-like shape, which effectively forces the hand (including the SLC) into a position of permanent abduction. An SLC, usually tightly articulated but not fused with the hand, is present in a wide range of theropods. For example, a kind of incipient, not terribly convex SLC is present in Allosaurus, a theropod quite remote from the origin of birds. Allosaurus, we discovered, also has a radiale that is more block-like than wedge-shaped: the articular surface for the SLC is oblique only to the tune of a couple of degrees. This adds up to a wrist joint that probably had very limited mobility, symmetrically distributed between abduction and adduction. Theropods closer to the origin of birds than Allosaurus tend to have a much more convex SLC, and accordingly a much more mobile wrist joint. 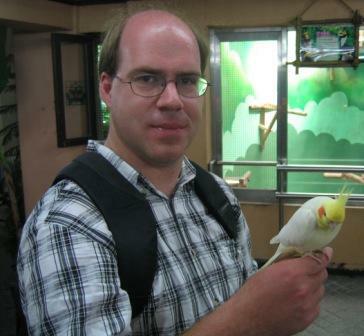 Furthermore, the radiale becomes gradually more wedge-shaped on the line to birds, as my coauthors and I found by measuring the radiale in a range of theropods and using a computer algorithm to reconstruct evolutionary changes in the angle of obliquity. It appears that mobility of the wrist evolved at a relatively early stage, while asymmetry followed more slowly. Beyond establishing that some derived non-avian theropods were capable of partly folding the wrist, we got interested in the question of why they would have wanted to do so. To put this more respectably, what selective advantage might an incipiently avian-like wrist have offered to a terrestrial theropod like, say, the oviraptorosaur Caudipteryx? Inferring selection pressures in the fossil record is always a hazardous business, but some of our observations at least suggest a strong possibility. As the wrist was becoming more asymmetric, both the arm feathers and the arms themselves were also becoming proportionally longer. Both factors would have made the feathers more vulnerable to damaging contact with the ground, entanglement in vegetation, and other random insults from the uncaring Mesozoic universe. It’s possible that wrist asymmetry evolved to allow protective folding of a feathered arm, allowing the feathers to be tucked more or less out of harm’s way. It’s also possible, inverting the scenario, that wrist asymmetry evolved for some other reason and simply made the evolution of longer arms and longer feathers feasible. A dead dromaeosaur (courtesy of John Conway) showing long hand feathers that have survived better than their owner thanks to the flexed wrist. Leaving aside these ticklish questions of cause and effect, it’s clear that a mobile, asymmetric wrist is not so much an avian specialisation as a feature that birds inherited from non-avian theropods and subsequently took to greater extremes. It’s also clear that this type of wrist began to evolve in a terrestrial setting, and was only subsequently co-opted to execute the movements necessary for powered flight. Flying birds traditionally inspire poets and aeronautic engineers alike, while birds standing around with their wings folded rarely inspire anybody. However, I like to think that wing-folding is an important behaviour in its own right, and one that has its place in discussions of the transition to birds. Sullivan, C., Hone, D. W. E., Xu, X. and Zhang, F. The asymmetry of the carpal joint and the evolution of wing folding in maniraptoran theropod dinosaurs. Proceedings of the Royal Society B. Published online March 3, 2010. This is very interesting, i’m trying to imagine giant turkeys with teeth! 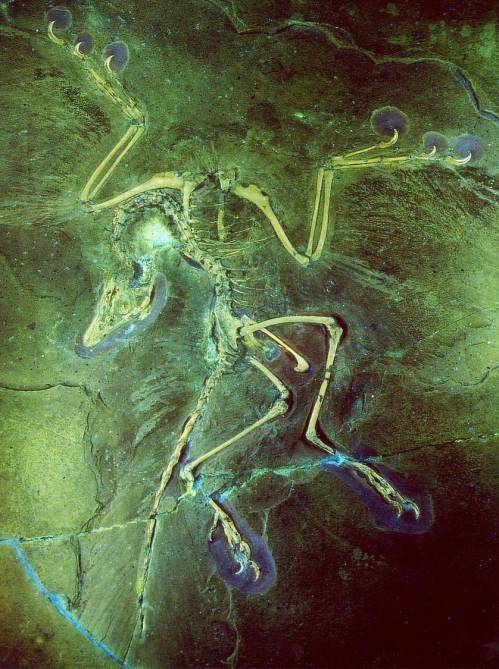 I wonder, can you tell from the fossils if they had robust arm muscles, though flight may have been a long way off, could there have been any use in flapping to make for higher jumps, or spacial control while feet were off the ground? If flying insects were a large part of the diet, this may have made it much easier to catch them, alternately, this may have assisted in jumping from boulder to boulder, over very rough terrain, or from top of tree fern to top of tree fern. Well the first thing to remember here is that this paper covers a huge range of animals in terms of body size and ecology. While we tried to pick taxa that were closest to the stem lineage for birds, (and thus if you like, least ‘diverged’ from the ancestral condition) our selection does include large bodied hebivores (therizinosaurs), fast runners (ornithomimosaurs) and really everything from allosaurs to birds. So in terms of our new paper at least, any hypotheses at to the evolution and retention / expansion of these characters is going to have to take this into account (hence the problem with the ‘hunting’ hypothesis). If you want to talk more specifically about derived maniraptorans (that are very close to birds) and look at more general forelimb characters (like arm muscles etc.) then things get even trickier. In terms of arm musculature you can get an indication of relative size through the presence of muscle scars on bones, the sizes of various crests and trochanters that muscles attach to and things like the size of the sternum. In that sense, paravians (dromaeosaurs, troodontids and birds) have bigger arm muscles than (in general) do other theropods. This could well be associated with some form of arm control during jumping / proto-flapping (like WAIR) though of course it’s unlikely to be true in all cases (like with Utahraptor, it’s just too damned big). I suspect most small theropods would have taken any insects they could easily catch, but only a couple of troodontids have been suggested as being primarily insect eaters so that aspect’s a little problematic too. This whole area (as I’m sure you know, it’s generally called the ‘ground-up vs trees-down’ debate) is really complex. It covers a huge range of morphological, ecological, evolutionary and biomechanical arguments and is something I’m not going into here (and to a degree was avoided in thew paper to keep things simple). Certainly I think I’d agree that for some paravian taxa bigger feathers and better arm muscles might have helped them jumping / flapping / running / whatever, but exactly how they might have doen this and which animals were involved is really uncertain at the moment. 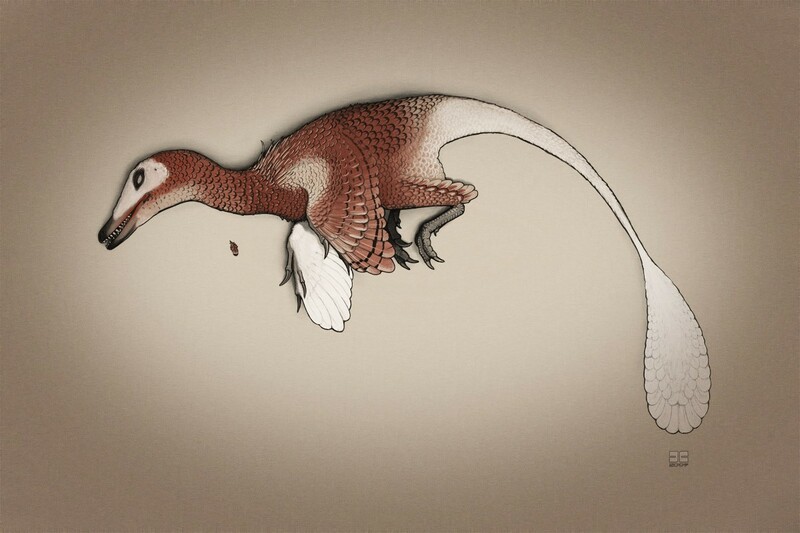 If a small dinosaur had arm feathers for some reason such as display or temperature control, folding the hand back would keep the feathers out of the way, so they could grow longer and broader, perhaps until they provided some lift during jumps. That’s basically what we are implying in the paper, yes. Does Tyrannosaurus have a more convex SLC than Allosaurus? Well we didn’t get a measurement for Tyrannosaurus itself, only Guanlong as a basal tyrannosaur. However, this was significantly greater (though still small in absolute terms) than Allosaurus, so it’s reasonable to think that Tyrannosaurs did have a higher value than Allosaurus. I assume that you are trying to imply that we are wrong about prontation there, but if you want to have a discussion, please discuss. Don’t just quote someone else and not actually *say* anything. I’m not entirely convinced by that, there’s no palm print or finger prints, just claw marks and given how the hand is constructed in theropods it is conceivable that this kind of trace could be left with a ‘clapping’ or close to clapping hand posture. In any case, this is a sole example of a single animal. We have a lot more data from the bones of a great many taxa suggesting that pronation was limited or, in soem, non-existant. This *may* contradict that here, but does not make the other evidence invalid. In short, it’s something worth noting and considering, but not critical. That link also incidentally strongly implies that this has never been published and is only out there as a now 8 year old abstract so it’s hard for anyone to say anyhting meaningful about it without a formal paper on the subject. Where is the pterosaurian 5th finger? Sauropod tails: up or down?